In response to a question regarding Apple's plans for streaming video, asked by Cross Research analyst Shannon Cross, Cook outlined four areas in which the company is currently focusing in preparation of an expected segment boom in 2019. 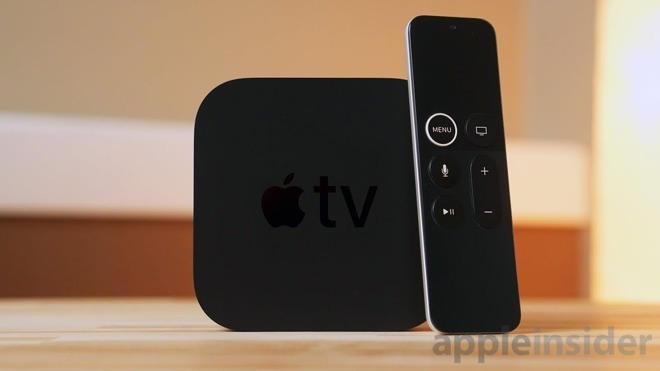 The first is the Apple TV, which acts as Apple's hardware anchor in the streaming game. The device has seen regular software updates with new features, and rumors suggest the company is mulling the introduction of a low-priced dongle to goose platform adoption. Secondly, AirPlay 2 will factor into Apple's streaming ambitions. The protocol launched in 2017, but has only recently received serious attention from major electronics brands. Most recently, AirPlay 2 is being added to third-party television sets from Sony, Samsung, LG and Vizio, allowing users to cast content from their iPhone, iPad or Mac directly to the TV. Apple's third opportunity for growth is through subscriptions from apps on the App Store. Cook believes more people will be subscribing to multiple streaming services as they cut back on traditional cable plans. Finally, Cook reiterated Apple's plans for original content that are rumored to debut as part of a first-party subscription service later this year. Apple has been rumored to be launching its own streaming service for some time, but distribution and cost components are still up in the air. Apple could choose to bundle the product with Apple Music or offer it as a free perk for Apple-device owners. The latest rumors suggest a possible March event with new iPad Minis and iPod Touches in the cards as well as a launch of the new video streaming service to follow as early as mid-April. Not that he's necessarily saying that -- but he did not mention any other streaming hardware device -- but it would be utterly suicidal to link Apple's streaming services solely to AppleTV and iOS/MacOS devices. Regarding the fall in Rev, missing guidance and major drop in iphone sales - Don’t worry everybody - Don’t worry - THEY HAVE OPRAH!!!!!!! This is a terrible idea. Too little, too late. Should have bought Netflix YEARS ago. Focus on expanding the hardware lineup. HomePod is barely a foot in the water! Completely left out home theatre options which made me pass. I know some market segments are saturated but there's got to be tons of areas that Apple could make "the best" product for. The latest thinking runs along the lines of Apple offering bundle subscriptions which will include streaming video, magazines and books, music AND apps for “rent”. Have a feeling they'll launch this along with a new Apple TV. I just wish they took gaming as seriously and launched a monster of a TV device with original Shows/Movies/Games. It's easy to say these things now and predict doom for the future. 1. We don't know what apple is working on. Everything they do is revolutionary so anything is possible. 2. Netflix has a ton of crap. 3. I can see this service making Apple TV more popular which will make their service more popular etc. A feedback loop. 4. Home theater has not been left out. Apple TV is the only product that supports both Dolby Vision and Atmos. Apple could be working on a better version of Homepod(and tvOS update) and a soundbar or woofer. But you can already hook up your home theater to Apple TV. Apple is also rumored to be working on movie theater releases for home, It doesn't get any more home theatre than that! As a long APPL investor, I'd be trilled with more product category disruptions. Netflix: Agreed! Tons of crap. But you know what? in order for film and tv ventures to be successful they need to venture beyond "Rated G." Art needs the ability to push limits and not be constrained by political correctness which is already a big issue with entertainment. Personally, I'm not interested in paying for yet another streaming service. I have Amazon Prime, Netflix and SiriusXM... I'm open minded by skeptical. I do want more from Homepod but unfortunately it would have to be amazing for me to get me to sell my equipment I bought with the HP disappointed me.